The banks of Gruene Road, located in the City of New Braunfels, Texas, are regularly subjected to erosion challenges because of flash flooding in the area. 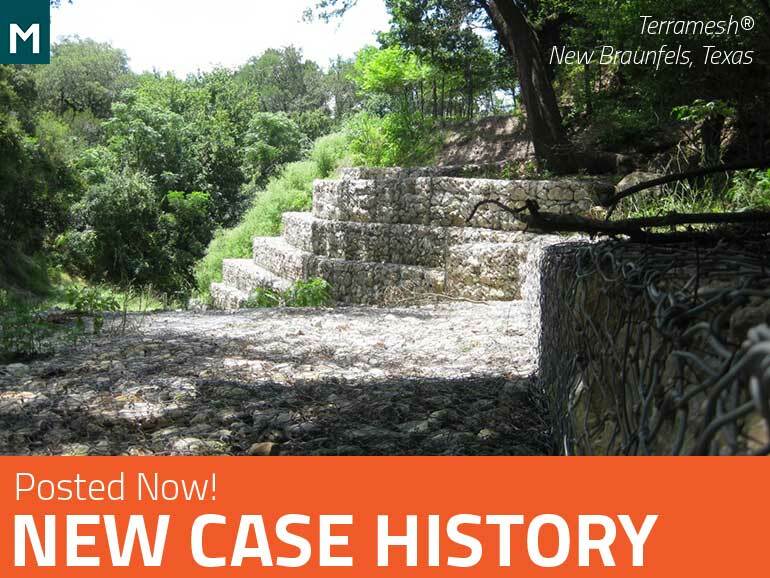 With the help of C.E.C San Antonio, we devised a solution to protect foundations and create additional reinforcement using Terramesh® and Gabion Mattresses. The banks of Gruene Road in New Braunfels, Texas, are characterized by sandy/silty clays, so when the area is regularly subjected to flash-flooding, parts of the road banks are carried away. This threatens critical infrastructure and businesses, including a bed and breakfast. The solution had to provide stability to the bank and erosion protection, compatible with intense water flows, and had to be vegetated in the upper sections. The project itself had its own unique set of challenges. The banks were too steep and would not allow for a traditional channel lining. Due to permitting and property limits, anchored solutions or geometric reconfiguration of the site was not possible. Additionally, the jobsite was only accessible from the creek below and construction could not impact on the business of the bed and breakfast; no closure of any kind was allowed. Together, we overcame the unique design and construction challenges of the project to create a structure that could withstand a major flash flooding event. We were the only supplier able to fulfill all requirements set forth by the Engineer-Of-Record to provide a sound solution for erosion difficulties in the Banks of Gruene. The double twist mesh soil reinforcement takes advantage of the friction acting along the surface of the wire and, more importantly, the mechanical interlocking properties of the mesh with the backfill. without any issue. The bed & breakfast was protected and could safely continue its business operation without risk of interruptions. Want to learn more about this project? Download our Case History here.